Professor Juan Lozano, Architecture, and Professor Roberto Orozco, MBA, have returned to their campuses in Mexico after visiting their colleagues and students at SUNY Broome County Community College. Professor Lozano teaches at la Universidad Autónoma de San Luis Potosí, and Professor Orozco teaches at la Universidad de Celaya. Both universities are in Central Mexico. The US-Mexico Multistate COIL Program (MCP) is designed to give collaborative online international learning experiences to students in the US and Mexico. According to NAFSA.org, fewer than 10% of all students graduating from US colleges have studied abroad. According to US News and World Report, that number is much smaller for community college students. In this context, the MCP provides curricular internationalization for up to 1500 students at US and Mexican institutions. Students enrolled in a COIL-enhanced class join together with students enrolled in a partner class at another college or university to work on assignments created jointly by their two professors. COIL gives them the opportunity to get to know, and to cultivate the skill of working with, their peers from another nation without ever leaving home. 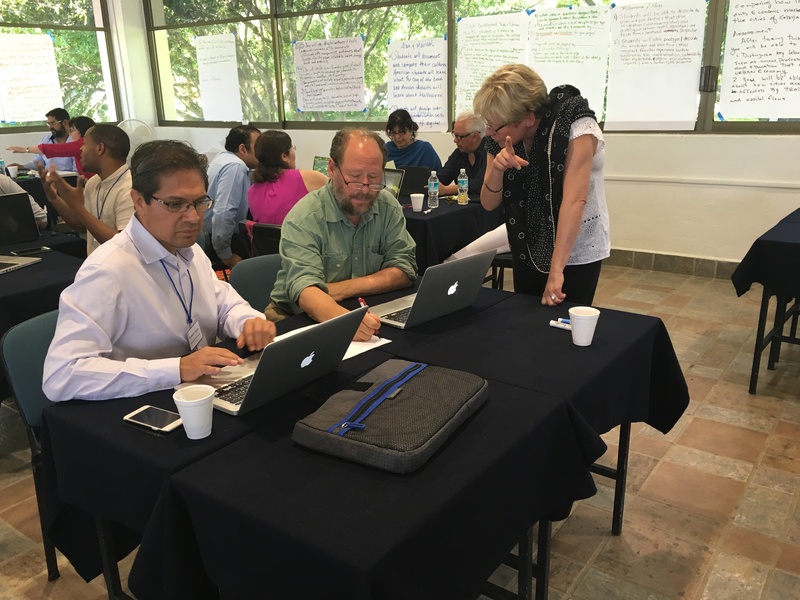 The MCP offers the opportunity for reciprocal visits by COIL professors to the US and Mexico to strengthen teaching connections and internationalization between institutions. SUNY Broom faculty members Kathleen McKenna and Lynda Carroll, who are co-teaching COIL-enhanced course modules this fall, hosted the guests at Broome during their visit. While they were here, the professors met with the classes they are collaborating with, and with classes in Architectural Design and Construction Management, Effective Speaking and Criminal Justice. Juan Lozano and Lynda Carroll presented a Common Hour Program entitled This Old House: Rethinking Communities Through Innovation, Renovation, & Preservation. Roberto Orozco spoke on The Mexican Economy at a breakfast meeting of the Student Branch of the American Society for Quality Control. He also visited Toastmasters at SUNY Broome (he’d met them virtually in the past) and together with Lisa Strahley and Kathleen McKenna, led 24 participants in a National Issues Forum deliberation on the topic of Immigration Policy. The guests enjoyed touring various locations in and around SUNY Broome, and as Professor Orozco said after a few drives through the countryside, the fall foliage and the barns along the road took his breath away. The SUNY COIL Center has recently been the recipient of two funded grant initiatives designed to establish and expand COIL partnerships in México and the Middle East and North Africa (MENA region). Through these project activities, the SUNY COIL seeks to increase academic collaboration between US and foreign institutions in these geographic regions through COIL-enhanced courses that utilize online technologies and project based instructional design. In June 2016, with the generous collaboration of Universidad La Salle in México and Al-Kafaat University in Lebanon, the COIL Center carried out 4-day workshops in Cuernavaca, Mexico and Beirut, Lebanon. The US-Mexico Multistate Program workshop gathered together 21 COIL teaching partnerships made up of US and Mexican professors based at 20 colleges and universities. The Stevens Initiative workshop involved the partnering of 8 institutions in 4 different countries to launch the preliminary phase of the partnership. During the course of the workshops, professors designed their COIL-enhanced course modules and constructed the learning objectives and activities for their courses. In total, both projects will reach over 1200 students during the fall 2016 semester; over 900 students from the US/Mexico and over 380 students from the US/MENA region. In these courses, students will carry out an online collaborative project in credit-bearing undergraduate and graduate level courses. The COIL workshops provided professional development and training to professors in designing their COIL-enhanced course program, and each workshop provided the opportunity for faculty to benefit from cross-cultural interchange, and to cement teaching partnerships to be sustained and cultivated into the future. The 2016 COIL Conference was held at the CUNY Graduate Center in Manhattan and was again a great success! From April 25-26th, the SUNY COIL Center was excited to welcome nearly 400 faculty, staff and administrators from over 150 different institutions and organizations from 23 countries, including 30 SUNY campuses and over 100 attendees from outside the USA. We encourage you to also access the conference resources that have been uploaded and are accessible via our Monday & Tuesday Conference Agenda pages. Here you will find PowerPoint presentations from most of the sessions. A video archive of all conference sessions will be posted as soon as possible! We are looking forward to seeing you at the 2017 COIL Conference.